Police say a security guard shot a man outside of a Kansas City apartment complex in self defense early Tuesday morning. 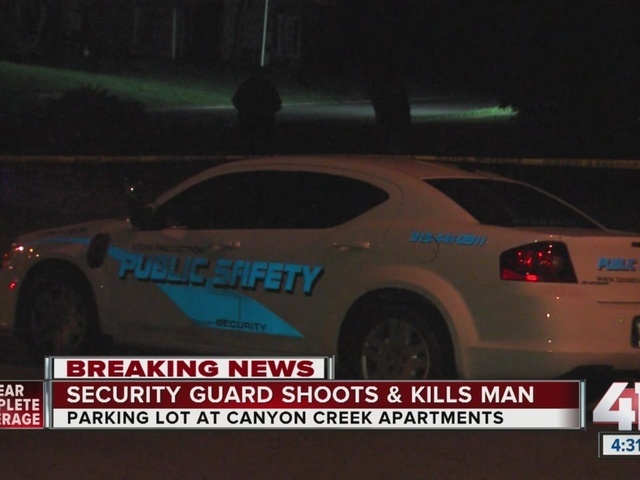 The man died in the parking lot of Canyon Creek Apartments near 93rd Street and Bales Avenue. The security guard working at the complex told officers he feared for his life when a man in his 20s approached him pointing a gun in his direction while he was taking a break. Officials say the man fired a gun in the direction of the security guard and the security fired back at least one shot. "He could've been a sitting duck," said police spokesman Darin Sapp. "Thankfully he was aware and ready to go. This unfortunately occurred, but he had to protect himself. Thankfully he'll be going home today." The security guard was not injured. Officers are tying to identify the man who was killed.